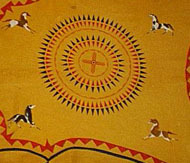 "Unique Native American Crafts offered by Cherokee Trails Trading Post"
Cherokee Trails Trading Post is proud to showcase some of the finest Native American Artisans. an American Indian Craftsman of Cherokee and Osage descent, describes his experience and training in the American Indian crafts as "having been working with the history of our people since I was a child". Rick has worked with the Dept's of Archeology and Anthropology from the University of Alabama, The Univ. of Georgia, and the Univ. of Mississippi. From his beginnings as a young man thru today, he has taken and absorbed much knowledge of his language and culture from his elders. For years, he has been involved in period correct historical presentations of the Indian culture in school system presentations, University level presentations, historically and period correct reeinacting, and with the movie industry. 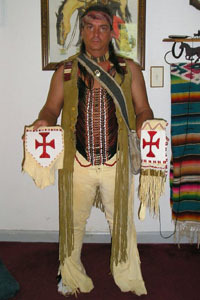 He specializes in "period correct" American Indian regalia. If you want your persona to be researched to the hilt, and duplicated, or if you want to reproduce any Native American item of interest to you, please contact Bob Strongbear Bates. 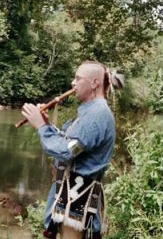 American Indian flutist Golana' (Cherokee for Raven), is an enrolled member of the Echota Cherokee Tribe of Alabama and a member of the Deer Clan (West). Golana' is an award winning and renowned artist in the field of Native American music. Golana's recent release of his fifth Album, "Lone Pine Canyon", finds this innovative master of the Native American Indian flute stretching the boundaries of his meditative, nature inspired music. Golana' is a five time NATIVE AMERICAN MUSIC AWARDS (NAMMY) nominee (including “Best Male Artist” and “Flutist of the Year”), winner of the 2004 Indian Summer Music Award for Best Instrumental Album and twice winner of the Coalition of Visionary Retailers Award (COVR) for "Best Native American Music". Award winning Artist ,craftsman and Recording Artist ,Daniel Bigay, an enrolled member of the Echota Cherokee Tribe of Alabama, lives in the Smokey Mountain part of Eastern Tennessee. He has been heavily involved in traditional American Indian art work for the past 25 years. 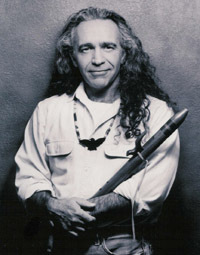 Daniel is renowned for his highly sought after Native American Indian flutes some of which are owned and played by some of the best know American Indian flute players, including Tommy Wildcat, Bill Miller, Ed Three Eagles and many others. Daniel's release of his second album "Bird songs" follows his highly successful first album, "Sacred Ground" by Spirit Keepers, both of which have met with critical acclaim. 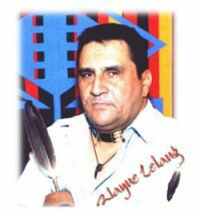 Wayne Letang is member of the Nishinaabek-Mattagami First Nations Tribes in Canada and a maker of Quality, Authentic Pipestone Pipes and sculptures done in various mediums. He has had a large number of his pieces showcased in the Exhibition, "Faces from the Forest". Wayne has been carving Ceremonial Pipes for 11 years. When asked about his works, he states, "It seems I have to listen to the stone or wood to tell me what is in it at times. I can't tell if it is going to be this way or that, only until the stone or wood reveals itself to me in the end do I know." Wayne's Turtle Pipe is featured in the "Pipes of the Millennium" 2001 Calendar published by the "Keepers of the Sacred Traditions of Pipe makers". George Knowlden is a traditional Artist and Craftsman specializing in traditional, authentically correct, museum quality Native American Beadwork, Porcupine quillwork, leather work, and weaponry with over 40 years experience. To his credit, George provided costuming for the movie "WINDWALKER"(first released in 1980), and for the Utah Travel Agency--providing costuming and authentic tee-pee's for film shorts promoting Tourism and travel to Utah as well as promotion of locations for the movie industry. He has been a featured Artist and Craftsman for the past 29 years at Utah's Festival of the American West; 5 time winner of the "Best Native American Regalia " at Ft. Bridger, Wy. and 2 time (1988-1989) Winner of "Old Style, Native American Costuming" at "Crow Fair" (America's Largest modern day encampment), Crow Agency, Montana. Although of American Indian descent George is not currently enrolled with a State or Federally recognized tribe, but prefers to let his work stand on it's own merits."